Vinyl Buddy record cleaner gives its users a quick and effective way to remove unwanted debris from their records. The specialized "tacky" silicon roller attracts the dust, lint, and debris to the surface of the roller by causing a sticking effect. Vinyl buddy's unique cleaning method can clean your dusty records in a matter of seconds, bringing back the best possible sound quality for you to enjoy. Vinyl Buddy is reusable, after cleaning simply rinse the roller under water until all the debris is washed off and you're ready for your next cleaning session. The rollers material is gentle and will not damage your records surface in any way. 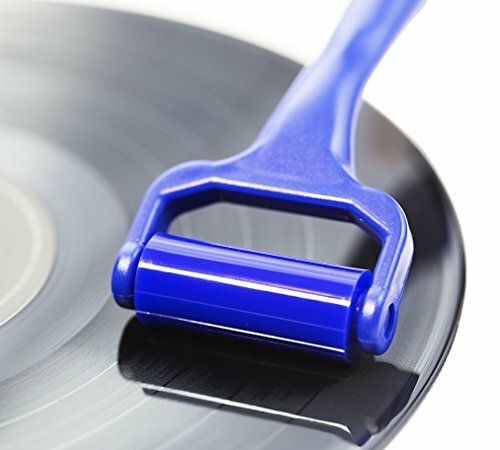 Other record cleaning products on the market such as microfiber brushes tend to smear the debris around the record rather than removing them for good. Vinyl Buddy does not have this problem as it picks up the particles and keeps them locked onto the rollers surface, taking away the frustration of brushing the debris around and around your record until you finally work the particles to the edge.